I originally sat down this morning to write a little email about my Expressive Painting E-Course, which commences tomorrow. But before this happens, I'd love to share a little story with you. This is the story about how my Life's Work as an Artist & Teacher first began ... and WHY. After a rocky first few months at primary school (I hated leaving my Mummy! ), I settled into school with a sense of possibility in my tummy. I had a nice teacher, Mrs Ganter and I'd made some nice friends. ... Or the times when we got to trace over big fat letters in our Rigby workbooks and I realised that I could write! Learning in those early days was fun and filled with wonder. Me with my cousin Dawn on our first day at school. I still remember the first time I had a painting class in grade one. Our teacher set up two easels set up in a dark, dingy room underneath our classroom and we were allowed down to paint. there, two of us at a time. Something VERY special happened within me that day. I can't remember what I painted. I don't recall what colours I used, or how long I spent there. Physically, all I recall are thick, chubby brushes and a big sheet of paper. The magic of that wondrous moment has stayed alive in my mind and body and it's one of my most treasured moments. No matter what was happening around me, I realised I could feel vibrant and free being me, when I created. From then on, I was unstoppable. Anything and everything in my life could inspire me (especially moss and puddles and plants) and I would want to relive that feeling, with some sort of Art-making. I would draw in the afternoons when I got home from school. I would write and illustrate these little books and display them in the classroom library. I would relish in the moments when we were asked to draw or paint or collage something in our botany books at school, or make a poster about some dead famous person. I didn't care. I was creating and I felt alive! Fast forward 30 odd years and now it's me creating the painting classes for others. Only this time, I've made sure the painting atmosphere is a little more inspiring and welcoming. The biggest gift I have to share is how to recreate a feeling of wonder and exquisite, inner freedom. 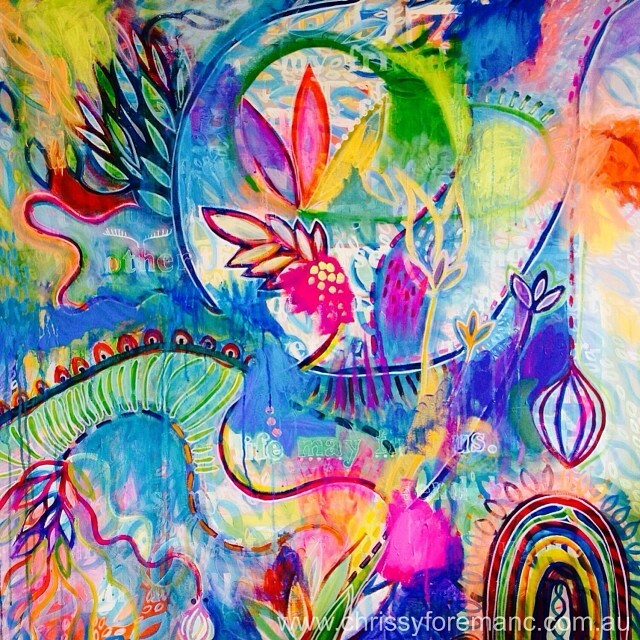 Yes, I teach how to paint, Yes, I share techniques on colour mixing and eye-popping colour combinations and layered compositions and how to make meaningful, rich paintings., using meaningful, rich content. But this is all just my vehicle. The real technique I am sharing, is how to access our innately free feelings, that is, the natural wonder we felt as kids, which still lives inside us today. Being an Artist is not about creating pretty, picture-perfect paintings. It's about shining the wonder from your heart, however that feels for YOU. I feel absolutely honoured, with every part of my big, colourful, spongey heart, to share my Expressive Painting E-Course with you. It's a painting course where wonder-filled Art is where our hearts can shine most brightly. If you would like to join me, my course starts tomorrow, Monday 10th March. Enrollments will stay open for one more week, for those of you who need to slip into class, without a late note. There's no scolding teachers found here. Only me, only wonder.